LW-400 - Better value for design! 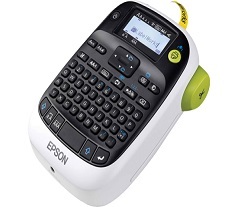 Epson LabelWorks™ printers offer easy-to-use, professional solutions for every kind of labelling need. Choose from a wide selection of Epson label media in a variety of widths, patterns, colours and finishes to create high-quality, professional labels with minimal waste and maximum savings. All LabelWorks printers are designed from the ground up for greater cost efficiency. The LabelWorks LW-400 can store up to 50 custom designs so that users can easily reprint label designs when necessary.